I love this material weight and the style. I would like it in all the colors. Perfect summer dress. Dress up or casual. WHAT CAN I SAY, OR WHAT CAN'T I SAY! THIS IS SUCH A BEAUTIFUL AND COMFORTABLE DRESS. IF YOU LOVE TO DANCE THIS DRESS WILL MOVE WITH YOU AND LOOK VERY ELEGANT. I PURCHASE A LOT OF CURATIONS AND IT IS GOING WITH ME ON MY CRUISE IN TWO WEEKS. LUV IT !!! 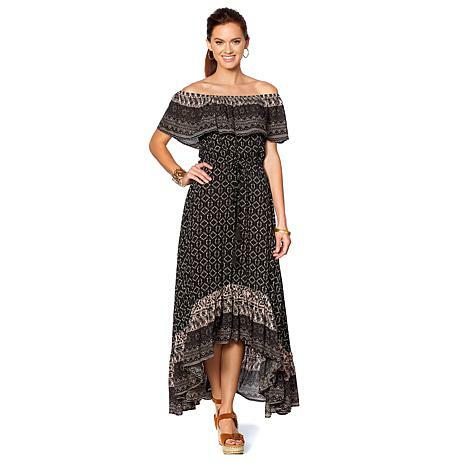 These dresses are awesome.Im 5'2 and they fit perfect.I loved the comfort and many ways to style them i ended up with all 3.I have gotten many compliments. Viscose is next to the best Modal.It's so light with a super cool feeling against my skin.The blue/white is a nice relaxed color. I made a mistake, ordered it too big, now just waiting.........I would order another one, it glides right over your figure; nobinding only where elastin is needed.